Liquid-saturated flows of particulate materials are ubiquitous in industrial and geophysical environments, including debris flows, slurries, mining and milling operations, sediment transport, and surface erosion on Mars. Unlike collision-dominated dry granular flows or sediment-laden liquid flows, this area of multi-phase flow research combines the mechanics of particle-to-particle interactions with the inertial effects of both phases and the effect of a viscous fluid. We have designed a new particle-liquid rheometer to measure the shear and normal forces for a liquid-solid mixture. These experiments provide a unique opportunity to explore the transition from transport in a pure Newtonian fluid to transport occurring during a dense flow of particles. The measurements will show the dependence of the stresses on the Stokes and Reynolds number, concentration, and other experimental parameters (such as the stiffness of the particles, gap size relative to particle diameter, and density ratio). These results will also allow us to develop constitutive models for these flows. To model flows of a liquid-plus-solid it is necessary to understand the role of particle collisions. We have done extensive measurements of normal and oblique particle-wall collisions. 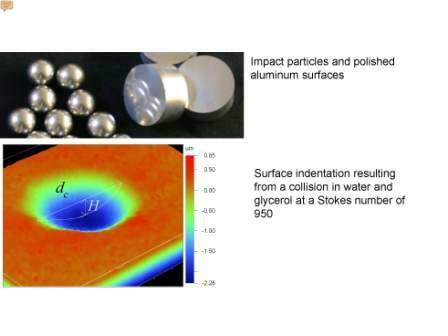 These results demonstrated that below a critical Stokes number, St <10, all of the particle's kinetic energy is lost during the compression of the lubrication film with no rebound of the particle. Above a second Stokes number, St >2000, the particle rebounds with negligible effect of the lubrication layer. In an oblique collision, the lubrication layer can significantly reduce the effective wall friction provided that the particle and wall are suitably smooth. For rough surface, the frictional effects are equivalent to that found in dry flows. Related experiments involve binary-particle collisions in a liquid, which differs from the particle-wall collisions because the target particle may move prior to the impact. Measurements are also being undertaken on surface deformation and erosion during impact in a viscous fluid. 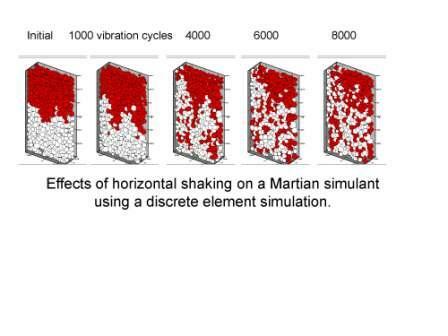 Both normal and oblique collisions will be examined for different Stokes numbers and material properties. We are interested in developing computational methods to compute flows in which particle interactions and the inertia of both the liquid and solid phases are important. To calculate the flow field, we have been using the immersed boundary method is used to simulate the process of a rigid sphere settling and colliding with a non-deforming solid wall. By including a contact model, the numerical method captures the elasticity of the solid boundaries and mitigates the resolution problem when the particle is close to the wall. The axisymmetric numerical method has been validated through comparisons with experimental measurements of particle collisions. We are interested in developing a three-dimensional code that models the collision process and can include many particles. In approximately 30 known locations around the world with large sand dunes, an avalanching of sand is accompanied by a loud droning or booming sound, which is not a noise composed of many frequencies but instead contains a dominant audible frequency and several higher harmonics. The sound can be heard after a naturally occurring slumping event or triggered by forcing sand down the leeward face of a large dune. In the later case, the dune will continue to boom and vibrate even after the sand has visibly stopped moving. Field measurements show that the frequency ranges from 75 to 110 Hz depending on the desert location and time of the year. Our measurements suggest that the physical features (such as a moisture barrier) of the sand dune plus the characteristics of the shearing on the surface may contribute to a wave-guide phenomena that results in a resonate behavior at a characteristic frequency. 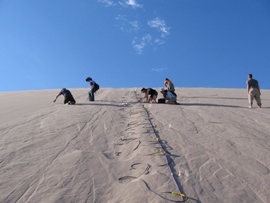 We have made extensive measurements in several dune locations using seismic refraction techniques and ground penetrating radar. 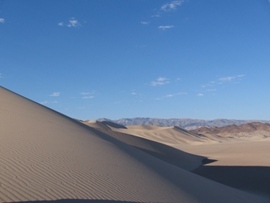 A sonic phenomenon in the Eureka sand dunes of Death Valley have mystified scientists for decades. Granular flows occur in industry (for example: dry chemicals, pharmaceutical powders, plastic pellets, toner), agriculture (grains, food products), natural environments (sand and debris flows), and in lunar and Martian exploration. Dry flows of these materials are governed by the particle collisions, and the interstitial fluid has negligible effect on the momentum transport. These flows are often modeled analytically by exploiting ideas from dense-gas kinetic theory, and through discrete particle simulations. In addition, discrete element simulations are used to compute dry flows by modeling the inelasticity and friction of the particles, and computing the motion by integrating Newton 's equation. We have been interested in mixing and segregation of granular materials, the effects of vibration, wave propagation, heat and mass transfer within the materials, and a variety of related processes involving these complex materials. M.L. Hunt, Robotic walking in the real world, Science, 339, 1389-1390 (2013). N.M. Vriend, M.L. Hunt, R.W. Clayton, Sedimentary structure of large sand dunes: examples from Dumont and Eureka dunes, Geophysical J. International, 190, 981-992 (2012). E. Koos, E. Linares-Guerrero, M.L. Hunt & C.E. Brennen, Rheological measurements of large particles in high shear rate flows, Physics Fluids, 24, 013302 (2012). X. Li, M.L. Hunt & T. Colonius, A contact model for normal immersed collisions between a particle and a wall, J. Fluid Mech., 691, 123-145 (2012). M.L. Hunt & N.M. Vriend, Booming sand dunes, Annual Rev. Earth Planetary Sciences, 38, 281-301 (2010). A. Ruiz-Angulo & M.L. Hunt, Measurements of the Coefficient of Restitution for Particle Collisions with Ductile Surfaces in a Liquid, Granular Matter , vol 12, pp. 185-191 (2010). 9 units (3-0-6); first, second, third terms. Prerequisites: Sophomore standing required; ME 12 abc, may be taken concurrently. An introduction to classical thermodynamics and transport with engineering applications. First and second laws; closed and open systems; properties of a pure substance; availability and irreversibility; generalized thermodynamic relations; gas and vapor power cycles; propulsion; mixtures; combustion and thermochemistry; chemical equilibrium; momentum and heat transfer including boundary layers with applications to internal and external flows. 9 units (3-0-6); second, third terms. Prerequisites: Ph1 and Ph2 (may be taken concurrently). An introduction to classical thermodynamics with engineering applications. First term includes the first and second laws; closed and open systems; properties of a pure substance; availability and irreversibility; generalized thermodynamic relations. Second term emphasizes applications: gas and vapor power cycles; propulsion; mixtures; combustion and thermochemistry; chemical equilibrium. 3 units (2-0-1) , 6 units (2-0-4), or 9 units (2-0-7) first term; 6 units (2-3-1), 9 units (2-6-1), or 12 units (2-9-1) second term; 12 units (2-9-1), 15 units (2-12-1), or 18 units (2-15-1), with instructor's permission, third term. This course presents the fundamentals of modern multidisciplinary systems engineering in the context of a substantial design project. Students from a variety of disciplines will conceive, design, implement, and operate a system involving electrical, information, and mechanical engineering components. Specific tools will be provided for setting project goals and objectives, managing interfaces between component subsystems, working in design teams, and tracking progress against tasks. Students will be expected to apply knowledge from other courses at Caltech in designing and implementing specific subsystems. During the first two terms of the course, students will attend project meetings and learn some basic tools for project design, while taking courses in CS, EE, and ME that are related to the course project. During the third term, the entire team will build, document, and demonstrate the course design project, which will differ from year to year. Freshmen must receive permission from the lead instructor to enroll. 9 units; (0-0-9) first term; (0-9-0) second, third terms. Prerequisite: senior status; instructor's permission. Experimental research supervised by an engineering faculty member. The topic selection is determined by the adviser and the student and is subject to approval by the Mechanical Engineering Undergraduate Committee. First and second terms: midterm progress report and oral presentation during finals week. Third term: completion of thesis and final presentation. The second and third terms may be used to fulfill laboratory credit for EAS. Not offered on a pass/fail basis. 9 units (0-0-9); first, second, third terms. Prerequisite: senior status; instructor's permission. Undergraduate research supervised by an engineering faculty member. The topic selection is determined by the adviser and the student and is subject to approval by the Mechanical Engineering Undergraduate Committee. First and second terms: midterm progress report and oral presentation during finals week. Third term: completion of thesis and final presentation. Not offered on a pass/fail basis. 9 units (3-0-6); first term. Prerequisites: ME 18ab, ME 19ab. Fundamentals of classical and statistical thermodynamics. Basic postulates, thermodynamic potentials, chemical and phase equilibrium, phase transitions, and thermodynamic properties of solids, liquids and gases. 9 units (3-0-6); second, third terms. Prerequisites: ME 18ab, ME 19ab, ACM 95/100 (may be taken concurrently). Transport properties, conservation equations, conduction heat transfer, convective heat and mass transport in laminar and turbulent flows, phase change processes, thermal radiation.